Fore some, riding a bike is a lifestyle. 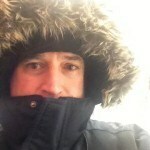 But if you live in a subarctic climate, how does one maintain a lifestyle mainly adapted to the summer season? 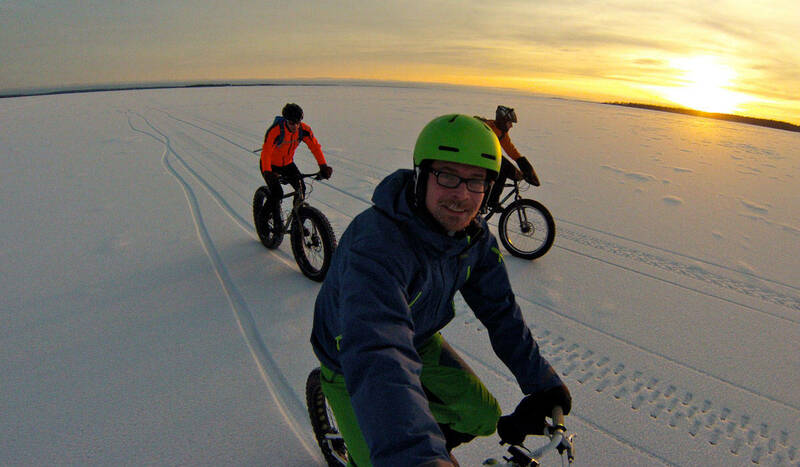 Hitch a ride with Olov, a Fat Bike enthusiast making tracks on the frozen sea. I am a cyclist. I ride my bike every day. For commuting, work-out, fun or just for the adventure. Living without biking is no life for me. But living in Swedish Lapland, just a couple of miles south of the Arctic Circle, complicate things. Sure, it’s possible to ride during winter. It’s just not the same thing as gnarly single-track during bright, warm summer days on your trustful two-wheeled steed. Biking over the frozen archipelago. But times they are a changin’. There is a new player in town. The Fat Bike. Developed in Alaska by cyclists with the same problems as me. The concept is simple. Just an ordinary mountain bike, but with bigger tires. A lot bigger tires! Making the wheels fly over the masses of snow. Fat bikes have been around for quite a time. The first series produced, was the Surly Pugsley, released in 2005. During the last few years, they’ve started to conquer the cycling world. Wider tires, all of a sudden, made the forest trails available despite loads of snow. Endless snowmobile tracks are my new game. 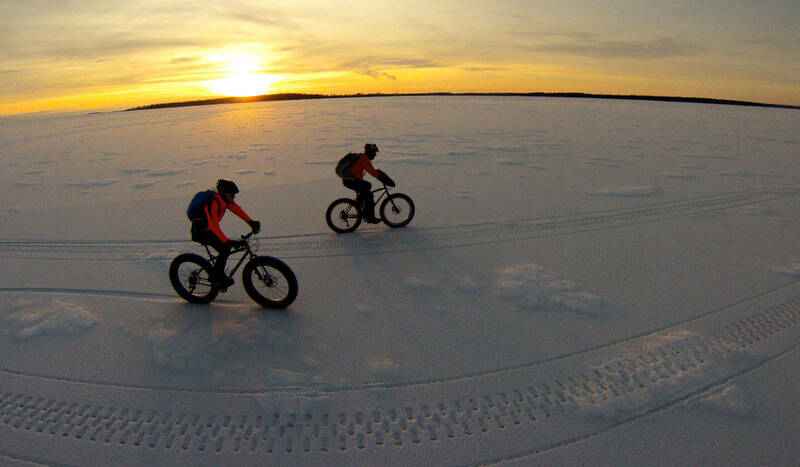 Endless ice, deafening silence and good friends on fat bikes - you have all you need in life. 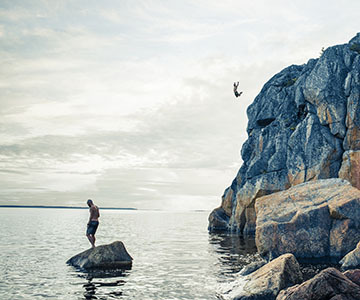 Another area that has been impossible to reach by bicycle, is the Swedish Lapland archipelago, with over 1000 islands. 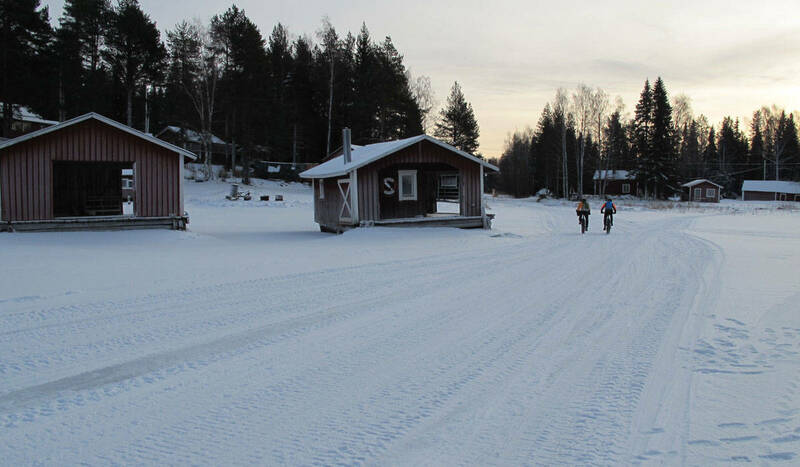 To conquer this area, I, together with other Fat Bike enthusiasts, started lobbying for a Fat Bike heat in the Nordic ski race Bothnialoppet (Race of Bothnia). It runs 60 kilometres on ice, along the coastal line between the cities Luleå and Piteå. Skiiers alone, the race has about 370 participants. Since fat bikes still is a pretty small movement in Sweden, there is no chance we’ll outnumber the skiers – yet. But you’ll be joining us, right? 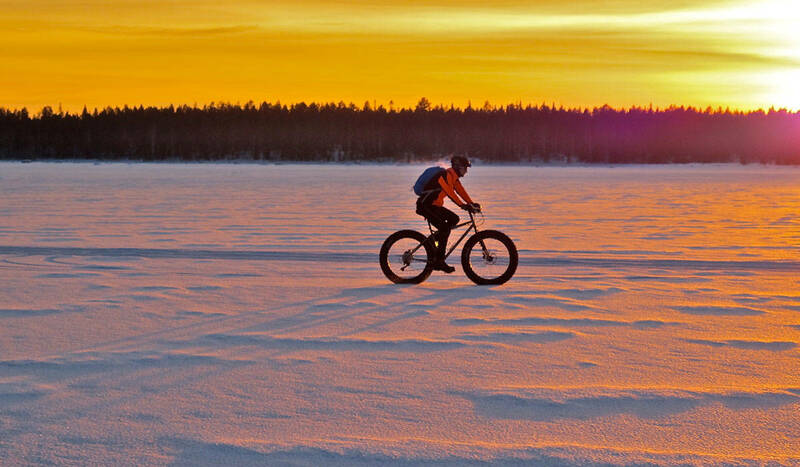 To get some ice cycling practice, I organised a bike adventure in the nearby Luleå archipelago. A beautiful day at the end of January some friends and I, took a trip to Hindersön. One of the larger islands that still has year-around residents. Brändön Lodge is a beautiful place on the mainland served as take-off spot. We thought we’d seek up and follow the snowmobile track to Hindersön from there. 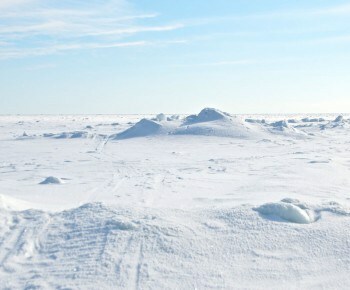 After a short car ride, we geared up and headed out on the great white plains that are the frozen Bay of Bothnia. Arriving to Hindersön, greeted by traditional fishing cottages. We didn’t find the snowmobile tracks but Brändön has a hovercraft. With no snowmobile tracks in sight, we followed the hovers’ trails instead. But after a few hundred meters, it seemed like the ice was rideable right about everywhere. The snow covering the ice had melted and then, followed by cold temperatures, frozen rock-hard. These conditions are pretty rare. We were in for a ride of a lifetime. When we realised how good the conditions actually were, we set course straight towards Hindersön. 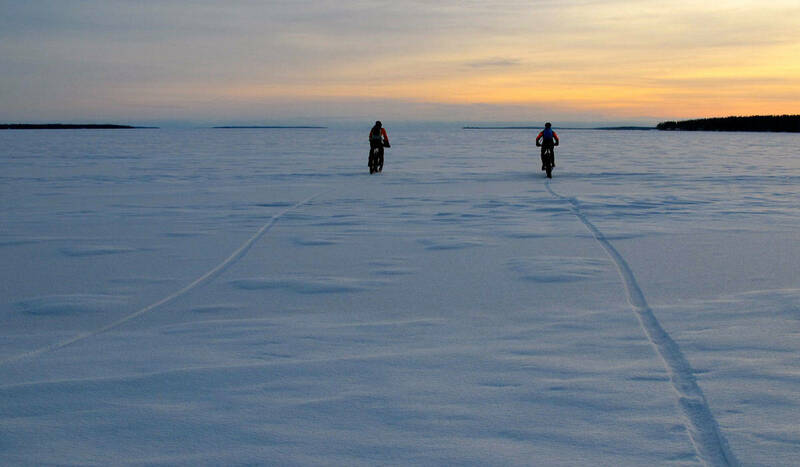 Riding a Fat Bike across the frozen sea is a feeling everyone should experience. It’s not traditional cycling, more like a mix of cycling, Nordic skiing and kayaking. Might sound a bit weird, but that pretty much sums it up. 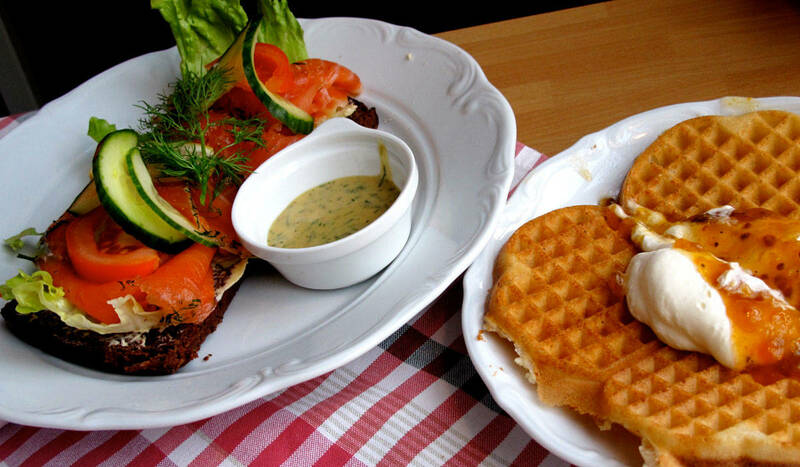 A cured salmon sandwich and waffles with cloudberry jam. What a reward! The sun was partly hidden behind a thin haze, creating one of the most beautiful lights I’ve ever seen. 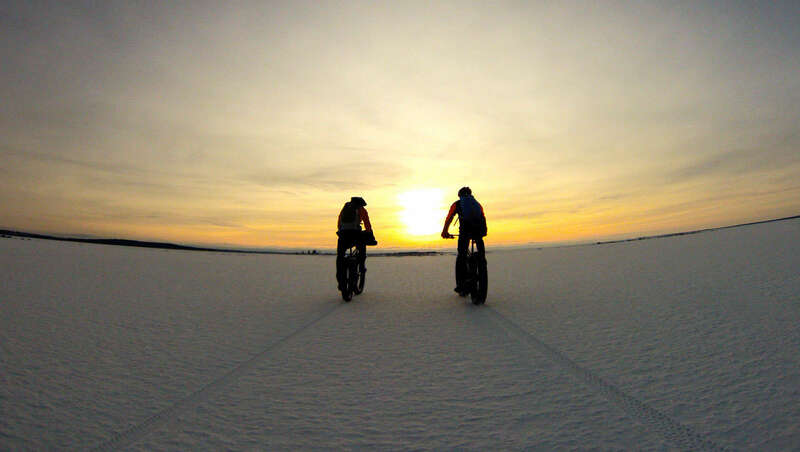 Combined with endless ice, deafening silence and good friends on fat bikes – you have all you need in life. Mesmerised by the beauty accompanying us, we arrived at Hindersön two hours and 20 kilometres later. Welcomed by the traditional fishing cottages in the bay, we found our way to Jopikgården, the island local café. Riding out into the sunset. Jopik is a very popular stop for excursions but people mostly get here by car (on ice roads though). Arriving by bike sure made other guests look twice. This was probably the first time someone got all the way out there by bicycle. But certainly not the last. We had a great lunch, Jopikgården serves great cured salmon sandwiches and their well-renowned waffles with cloudberry jam is a classic. 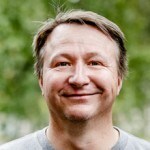 Have a look at Olov’s blog Bikelifeinswedishlapland.com to learn more about his biking adventures. 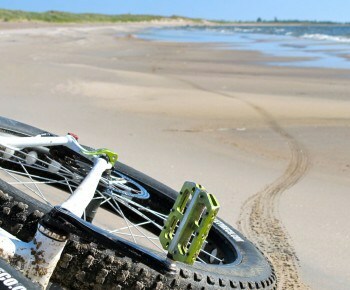 You can also get in touch with other Fat bike enthusiasts in northern Sweden in the Facebook-group Fatbike i norr. If you’re looking to rent a bike, you can turn to Fatbike Adventures in Luleå or Cykel & fiskecenter in Skellefteå for example. There was no time to waste. In January the days are still short and we wanted to get home before dark. On the way back we found the lost snowmobile trail. Still, it was way more fun to ride on the pack-ice instead. As we were getting closer to the mainland, the sun had started setting, creating a stunning, orange coloured, flaming sky. While packing our gear in our cars, we came to the conclusion that winter is the true cycling season. Summer is just a bonus. It was with some trepidation that I joined my first snowmobile tour into what looked like a frozen alien landscape. A place where no sensible person should tread. Sounds dangerous? Let me explain, I am a sailor. Happiest with a full main and perfectly trimmed genoa and standing on a heaving timber deck. Preferably somewhere tropical.